Check out this site -- called "Flash Doodle." Last year at this time, things were pretty exciting here in Chicago -- the Bears were in the Super Bowl. Was this just last year? Last year at this time, a story like this one in this morning's Tribune, about how the "the stressful emotions of big [sports] contests may in fact increase the risk of chest pains or cardiac arrest in spectators," would have been timely. This year the story is merely a painful reminder of how the mighty have fallen. Patriots vs. Giants? Boston vs. New York? Why should anyone outside the Northeast care? I suppose it will be interesting to see if the Pats can pull off the undefeated season, and it certainly would be interesting to see if Eli can pull the upset with the upstart Giants. But -- if history is a guide -- the game will either become quickly lopsided, one way or the other, or it will degenerate into a boring field-position-wait-for-someone-to-make-a-mistake kind of game. And the only thing worth watching will be the commercials. The Go Daddy! folks are trying to make the most of out their annual 'battle' with the network censors about how much they can get away with in their commercial. Please. The game is on Fox this year. The promos that Fox typically airs for its own programs during regular season football telecasts are not suitable for younger or more sensitive viewers -- can there really be many rules for advertisers? Lewis Lazare's column in this morning's Chicago Sun-Times reports that a company called Weatherproof has bought a two second ad slot for the Super Bowl this Sunday, at a reported price of $200,000. Lazare quotes Weatherproof CEO Eliot Peyser as saying, "We would have preferred to buy a one-second time slot, but it takes exactly 2 seconds to say the word 'weatherproof'." Not surprisingly, Weatherproof is being coy about what visual will accompany the micro-ad. They're hoping viewers will pay attention and look for the gimmick. I'll probably blink at just the wrong time. Younger Daughter turned 18 last September, so this coming primary is the first in which she'd be eligible to vote. But first she had to register. Younger Daughter's regular route to school each day takes her within a couple of blocks of the Skokie Courthouse, and she had a myriad of other registration options besides. Here in Cook County we take voting very seriously. It is a lifelong obligation... in fact, in Chicago, sometimes the urge to vote seems to continue long after life ends. But Younger Daughter wasn't yet with the program. Weeks went by following her birthday, then months, and soon the media were announcing that the deadline for registration was upon us. Younger Daughter was still not registered. I put my foot down: I told her if she didn't take the car over to the courthouse and get herself registered she wasn't going to be taking the car anywhere for quite a while. Yes, that's the nuclear option. Sometimes it must be threatened. Sure enough, the very next day, Younger Daughter managed to find the time to register to vote. Her registration card arrived just the other day... as did the realization that she would not be in the jurisdiction on Election Day. She's set for a band outing, starting during the Super Bowl and ending late on Election Day. There's something extremely un-American about this trip, don't you think? But -- particularly in Cook County -- there's always a way to vote. Younger Daughter could, under these circumstances, legitimately request an absentee ballot or she could vote early. One of the neighborhood libraries was designated as an early voting site. She chose the latter option. Now there are a lot of races in Cook County on Super Tuesday besides the Presidential primary. We have a hotly contested State's Attorney's race, for example. In our ward, there's also a very hotly contested race for Democratic Committeeman. And there are nine countywide Circuit Court vacancies at stake and three vacancies in our home subcircuit. Cook County being effectively a one party state, like Cuba or many of the now-independent former Soviet republics, the winners of the judicial primary races will be uncontested in the November election. And, as a lawyer, I have a particular interest in the judicial races -- these are the men and women who may be throwing my cases out of court in the very near future, causing my family to starve. So you might think my daughter would ask my opinion about who to vote for, right? You might even think that, as a first time voter, she'd be energized into doing her own research into the various offices and candidates. Of course, if you thought any of that, you'd be wrong. After she voted, we asked Younger Daughter about her choices. She remembered who she voted for for President (and she was shocked to find out she was voting for delegates to the nominating convention, too)... but she couldn't remember much about who else was on the ballot. There were so many names, she said. And people wonder why I fear for the future. That was the headline tonight on Yahoo! News for this Reuters story about findings soon to be published in the journal "Social Science & Medicine" by a team of British and American researchers. First reaction: Somebody got PAID to come up with this? I hereby announce my willingness to do a study on whether the Sun is or is not likely to come up tomorrow. Or whether a person opening up an email account is or is not likely to hear soon thereafter from a Nigerian general's widow. It's especially nice because I've been neglecting this blog of late. I've previously mentioned my other blogging project under a different nom de plume. (No, I'm not going to say what it is or where. Suffice to say that the other project will shortly run its course.) And business has picked up some, too, so I've been busier with that. Some other things taking up my time... well, it's not time to talk about them yet. In the meantime, there are so many things here I haven't kept up with. Like visiting other blogs. Hilda sent me an invite to 'friend' her on Goodreads -- I'm on their mailing list thanks to Sari, but I've never figured out how any of that works. However, someday soon, I'll be able to put a little more effort back in this Second Effort. Blogging superstarBarb, the cosmic force behind Heads or Tails, widely recognized as the Gold Standard among weekly memes, wants us to provide a contemplative post today. She asks us to consider -- who would we like to meet and why? So light a candle. Chant among yourselves for a couple of minutes. OK. Are we all centered now? I know what's expected of me. Honest. There are so many fascinating people in history... so many wonderful moments... it's tempting sometimes to wish that one were a fly on the wall... to see those people, to witness those events first hand. And then I think about what's likely to happen to the fly on the wall. You should pardon the expression -- that's kind of a buzz kill, isn't it? Now, if I could be like this guy -- go everywhere, in any time, and not get smashed like a bug, that would be alright. 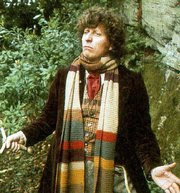 Of course, this guy had to put up with Daleks. I'd rather not have to do that. And I'd want a TARDIS that worked properly. Have I wandered off topic again? My point was that I don't think I could pick out just one person to meet. I thought about meeting my younger self, to provide constructive advice about how to avoid the pitfalls of the future. And, of course, to buy Microsoft when it first went public. But I'd never believe me. I've followed this story arc this week in the comic Zits (I like everything about the comic strip except the name) with a touch of nostalgia. I never got picked up by the police for driving by a girl's house 17 times when I was in high school... nor did I ever sneak out of the house in the middle of the night to do it... but I did a lot of driving by houses. Over and over again. This is what we called "cruising" back in high school -- not exactly how the word was used in American Graffiti -- but the meanings are arguably similar. In both reel life and real life the cruiser has hopes of seeing and being seen. Of course, where I lived, out just past where Christ lost His shoes, the houses were set back so far from the country roads that you often couldn't see the house of the girl in question. Cruising was best in the the winter because there were no leaves on the trees to block your (distant, partial) view of the house. And certainly no one in the house ever knew that it was the same car going past every few minutes. It was hardly voyeurism -- you couldn't really see anyone or anything. And I don't think it could be called "stalking" either. Back then, out in Exurbia, the roads were lightly traveled. The danger of getting into an accident was surely much less than it is now, living in Chicago proper. But Younger Daughter is apparently "cruising" with friends. The other night, though supposedly going to a girl's house just a couple of miles away, she racked up over 40 miles. That takes some doing in Chicago. We didn't want Younger Daughter driving our car to a basketball game at a high school some distance away. She told us the other girl would be driving. But even if she'd defied us on that one, she shouldn't have put on more than 20 miles. 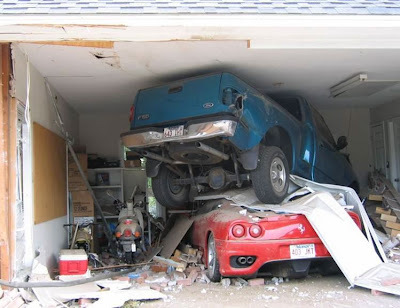 Eventually, Younger Daughter said that she and her friends "got bored" and went driving. After all, we only told her not to go to this particular school -- we didn't specifically say not to drive everywhere else in the known Universe. There's something here about the 'sins of the father' isn't there? Heavy thoughts about a warm coat? 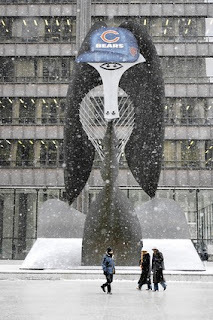 Those are pigeons huddling for warmth around the Eternal Flame in the Daley Center Plaza last week. 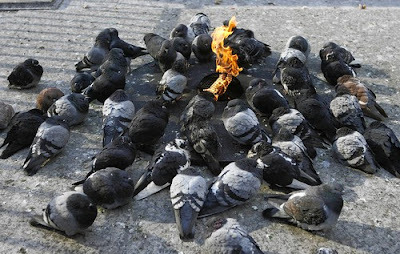 I don't know what's huddling around the flame this morning... it's below zero out and I did not dawdle this morning on my walk from the subway to the Undisclosed Location. I did my best to stay inside as long as possible and outside as little as necessary. It's cold today. It's so cold that Al Gore is probably checking his figures somewhere. This would be the day to wear the Zero King. I planned to, after I heard the weather forecast last night. I planned to -- but when the time came to leave this morning there was not enough time to put the plan into effect. The Zero King is a coat. It was my father's. It is the warmest coat I have ever owned, and the warmest I am ever likely to own. It is long -- it goes down to my shins -- and it has an enormous collar that can be pulled up to cradle my head. It was the weight, really, that scotched the plan to wear the coat this morning. To wrestle the Zero King out of the closet and put the down jacket back in the closet would have taken too long and Long Suffering Spouse was anxious to depart. The car needed time to warm up. The windshield needed to be brushed off. The down jacket is a bit... worn. The cuffs are filthy -- newsprint rubs off -- and it has a splotch of blue paint on one shoulder, a souvenir of a Cub Scout den meeting one night some years back when Long Suffering Spouse and I were both allegedly in charge of a Webelo den. Long Suffering Spouse came up with all the projects, bought and brought all the needed supplies, got the room at school, and supervised the boys as they worked on whatever arts and crafts project she'd devised. But the blue paint came from one of those projects. Some kid put his newly over-painted creation on my coat. Because it looks increasingly disreputable, I try not to wear the down jacket on days when I have to go to court. Of course, when it gets cold or snowy in Chicago, we all go into grim-struggle-for-survival mode. I wouldn't be the only one in a down jacket at court if I wore it there -- but I still try not to. If I had to go to court this morning, I would have struggled to get the Zero King out of the closet. But I didn't... and I didn't. No, not for real -- this is something I Stumbled upon at this site. I am really sorry, but I know with your kind-hearted personality you willforgive me. P.S. (the letter continues) -- Your girlfriend called. Barb, the world famous impresario who took Heads or Tails from total obscurity to the world stage, today asks us to write about "the Five Senses." I didn't think anyone remembered them anymore. Look at these guys: The Five Senses. This was perhaps the greatest rock band in the history of Bumbleburg, Illinois, a Chicago suburb so obscure that you'll never find it on any map anywhere. Well, actually, only three are pictured here. After joining the band, the drummer, Eggbert "Stinky" Malone, swore off bathing entirely until the group received a recording contract. Since the band never did get a recording contract, it wasn't so very long before none of the other band members could stand to be in the same room with him. That was the real reason the Five Senses used those enormous smudge pots on stage at every gig -- they were attempting to mask, as much as possible, the smell of Stinky Malone. The band eventually broke up because the cost of the smudge pots ate up all the meager proceeds of the band's engagements. It was a dark day for music lovers -- but a bright new morning for the citizens of Bumbleburg because, on the morning after their farewell performance, Stinky Malone showered. The EPA took Bumbleburg off its list of most polluted municipalities shortly thereafter. No one knows whatever happened to Malone, by the way. Some say that all that was left of him was dirt and grime -- so that, when he showered, he simply was washed away. Whatever the truth of the matter, he's never been seen again. The other missing band-mate is Louis "High Note" Zukerman, the second lead guitar. High Note had this amazing head of blond hair. He looked like he was eight feet tall. He had to duck under doorways to get through. Even as a youngster, High Note's hair was piled so high on his head that he was asked to go out for his high school basketball team. He was cut from the team after he got a haircut. It turned out he was only 5'3" tall. The hair grew back eventually. And, oh, could High Note scream. Why Zukerman was missing when this historic photo was taken has never been adequately explained. One theory is that he would not have fit in the room. But any fan of the Five Senses -- and, at one time, there were as many as six -- would tell you these were the core band members anyway. On the left you'll probably not recognize Vince "Tasty" Freeze, the other lead guitar (no, that's not a harmonica, it's a sandwich he's mouthing -- there was so little time to eat for bands on the verge of earning a profit). In the center is bassist Elmo Guggenheimer. Elmo was called Dr. Feelgood by his bandmates. Some say it was because you could feel the intensity of his bass lines right up through your feet when the band performed. Actually, Elmo got his nickname because he sold all sorts of various little pills trying to make ends meet. He's in a Federal penitentiary these days. Finally, on the right, there's the rhythm guitarist, Nick Balzeko. Nick's guitar was never actually plugged into an amp during any of the band's concerts because he couldn't play a note. He never knew it, though, because he was deaf as a post. And the other band members thought he had a good look on stage. Nick also left us too early: He was struck down by an ice cream truck one afternoon near a Chicago park. He couldn't hear the truck playing "Turkey in the Straw." As for the guy in the back? He was a process server. I do not refer to her bringing up Tony Rezko -- his upcoming trial may show whether you were dirtied on the way up through the sewer of Chicago politics and, if so, how much or how little -- but Senator Clinton is not waiting for the trial. No, she's trying to weigh you down with those crazy expectations again. Her media people are feeding everyone -- even those columnists and commentators in your corner, like Jennifer Hunter in this morning's Sun-Times, people who should have learned better after New Hampshire. Now the experts are spouting that Clinton's giving up in South Carolina -- that she's altered her travel schedule to head west to some Super Tuesday states out there -- that anything short of a loss by a double-digit margin in South Carolina would be a 'good week' for the Clinton campaign. This is Lou Holtz, once the coach of Chicago's other pro football team, the Notre Dame Fighting Irish. Later, he was head football coach at the University of South Carolina. But that's not the tie-in. No, when Holtz was at Notre Dame he was a master of building up his opponents and holding down expectations. The Little Sisters of the Poor would be coming to South Bend to be sacrificed to the Fighting Irish on the following Saturday afternoon. The Vegas line would be 70 points or maybe 80. But Holtz would come out of the film room shaking his head at the press conference, expressing tremendous fear about some tendency he'd noticed that, if not handled very carefully by his boys, would allow the Sisters to snap their 500 game losing streak. The press would laugh at the very idea that Holtz's boys would even work up a sweat on Saturday -- and Lou would get gloomier, even more pessimistic. If you took him seriously, even for a minute, you wondered whether his boys would even bother to show up. Think Lou Holtz, Senator. Start tamping down those expectations that Senator Clinton's surrogates are building up. Blogger announced yesterday that it is now available in Hebrew, Arabic and Persian. Now you can blog in Hebrew or Arabic or Persian and run your text from right to left. I wonder if anyone is blogging in Hebrew and Arabic at the same time. Now that might be something to brag about. Speaking of insoluble political problems, let's talk about the American presidential primaries for a minute. Much has been made, of late, of Senator Barack Obama's experience, or lack thereof, as he seeks the presidency. Recently columnists such as Fr. Andrew Greeley and Eric Zorn have questioned the extent to which prior experience helps one become a great American President. Both note another candidate from Illinois, with limited experience in Congress before coming to the White House, did just fine. And Obama would be the last to dismiss parallels between himself and Abraham Lincoln. Zorn notes that "Obama all but donned a stovepipe hat when announcing his candidacy in Springfield." Greeley writes about Presidents who should have been amply prepared, judging by their résumés, before assuming office: James Madison (who despite his wealth of pre-Presidential experience had to flee Washington one step ahead of invading British troops) or Herbert Hoover (prior Cabinet experience, the man who kept Belgium and Russia from starving) or a certain two-term Governor of the State of Texas whom Fr. Greeley loathes so thoroughly that he must bore his confessor to tears recounting ad nauseum his un-Christian thoughts about the man. I wonder if anyone -- ever -- is prepared to be the President of the United States. I wonder if it is possible. I suspect that it is not. I think that the times and circumstances and inevitable trials may bring out any hidden greatness in the character of the occupant of the office. Or not. Which is a sobering thought less than three weeks from Super Tuesday, isn't it? It's cold in Chicago this morning. Temperatures were in the single digits when I got up this morning, but they've climbed into double digits and are approaching the teens. It's crisp and clear. Cold and flu viruses (virii?) are dying by the gazillions, unable to survive the journey from one person's wheezing to the nasal passages of the fellow walking past on the sidewalk. Tonight, allegedly, temperatures will drop below zero. Welcome to January in Chicago. But to watch the TV news last night -- the grave intonations of the studio anchors -- the grim warnings of the reporters doing stand-ups outside (some with hats, some without), you'd think there was a meteor heading straight for Millennium Park. We get this also anytime a snow accumulation of more than an inch is predicted. I can understand and appreciate that this tone is entirely appropriate when a meteor or hurricane or invading horde is in fact approaching -- but not to hype a perfectly ordinary weather forecast. What triggers this kind of phony 'this-is-the-voice-of-doom' tone on your local newscasts? Older Daughter is back in Champaign now. You remember her: Older Daughter, the one with the B.A. in English, now putting those expensive skills to work as a BArista at a Champaign Starbucks. She has taken this job because she has decided to use her English degree as a springboard into............... (it's hard to write a drum roll, isn't it? well, imagine one anyway).................nursing. Yes, Older Daughter successfully got through last semester's pre-reqs and has been accepted into a nursing program. And she's happy and she's excited about it -- but where's the comedy in that, eh? Therefore, let us focus in on a recent call home: Older Daughter called Long Suffering Spouse to complain about her work schedule. She'd only been scheduled for five hours this week. After long discussion, it finally emerged that the baristas give store management lists of hours when they are available -- many are students or grad students in a college town like Champaign and so have varying schedules. Management then schedules employees according to their own needs, but using the available hours lists as a guide. Older Daughter had submitted a list of only 27 available hours; she expected management to pick 20 from those. Well, she explained, after Long Suffering Spouse stopped exploding, if she said she was available on Fridays, when she has no classes, they might schedule her and that is the day she wants to set aside for studying. There were explanations for each and every day she omitted. As usual, Older Daughter had imagined the way things should be if they were just perfect for her... and was amazed that the world had failed to accommodate her. When Older Daughter was a baby, and all the other babies her age crawled, Older Daughter sat still. If a desired object was on the other side of the room, she would cry until one of us divined her intentions and brought her the object. Eventually, we figured out that we were getting well-trained and Older Daughter wasn't learning to crawl. So Long Suffering Spouse, the psychology graduate, placed Older Daughter in one corner of the playpen... and all her favorite toys and stuffed animals in the opposite one. We steeled ourselves to ignore Older Daughter's plaintive cries. Long Suffering Spouse and I resolutely went about our business elsewhere in the house -- but we stopped pretending we weren't listening the moment the wailing stopped. ...And there was Older Daughter (Only Daughter, then) sitting exactly where we left her but surrounded by her toys and stuffed animals. She hadn't crawled at all. Instead she pulled the blanket on the bottom of the playpen toward her, bringing her stuff along with it. She had rearranged her playpen-universe according to her own requirements. And she's still trying to do that even now. So far, however, the real universe has not been as easy to overcome. The last couple of days here at the Undisclosed Location remind me of a guy I used to work for. I hope you'll forgive me if I make this guy sound like the inspiration for Dilbert's Pointy Haired Boss. 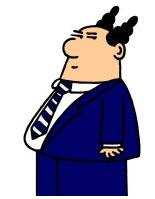 Actually, I think one reason why Scott Adams is so successful is that there have been so many inspirations for the Pointy-Haired Boss. Anyway, whatever I was doing at that moment was always the wrong thing to do. I needed to be working on this matter instead. From time to time he'd come in my office to interrupt me with advice: "Curmudgeon," he'd say [or he would have if that were really my name], "you have to learn how to figure out what's important. What are you working on right now?" "Nothing," I wanted to say, "not with you barging in here interrupting me every five minutes." On the other hand, I wanted to remain gainfully employed. So, instead, I'd say:"The Smith file." "Smith?" he'd bellow. "Smith? I just got off the phone with Sally [the claim manager for the XYZ Insurance Co.] and she's screaming for a report on the Jones case. That should be your top priority. What else are you working on?" My office in those days was rather like my office now -- piled high with papers and books at precarious angles. A major difference is that, in those days, we could smoke in our offices. Somewhere weighing down one of the stacks of papers was an ashtray. Probably with a lit cigarette smoldering. And, oddly enough, I never actually caused a fire. But, oh man, would it have been spectacular one if I had... all that paper! Anyway, I'd quickly scan the mess on the desk and respond. "I've got a motion due in the Black case." "Black?" he say. "That's important. The people at ABC Insurance are watching that at the highest level. You should make that your top priority." It was cruel, of course, but sometimes I couldn't help myself. So I'd keep the conversation going. "What about the White case? The reply on that is due Friday." "The reply?" he'd ask. "Well, then, that should be your top priority." "OK," I'd say, as though I cared about all of this. "What about Green? We were holding off on the status until the depositions were done and it's due for billing." Billing? There was nothing nearer or dearer to this man's heart. Or to the organ that pumped blood in his body where a human heart would have been. His response was, therefore, predictable: "Oh, yes, Green. You'd better make that your top priority." I of course knew he'd never simply agree with me, not without asking a few questions... just to be sure. "What about Brown?" "We were supposed to get the summary judgment motion on file last week but the plaintiff's deposition didn't come in until this morning." "Last week? Oh, no. That won't do. You have to make that your top priority." Somehow I kept a straight face in all this... even when I played my final card (I had work to do and I had to get back to it). You know what that last question was, don't you? You guessed it: "So then I should put Smith to one side?" "Are you kidding?" he shouted, losing patience with me at last. "That should be your top priority." Having established to his satisfaction once again that he was the boss and was managing the lowly, ignorant employee, he turned on his heel to leave the room. But he had to pause in the doorway with just one more bit of advice. "Curmudgeon, really. You have to learn how to set priorities." Anyway, it's been like that here the last few days... and I'm still no better at prioritizing... and I'm the boss now and there's no one to blame. Comrade Barb, the Glorious Leader of the Heads or Tails revolution, the mass rising of the blogging proletariat that will one day rule the world -- oh, sorry, getting carried away here -- well, anyway, Barb asks us to write today about a word beginning with the letter "C."
In a perfect world, I'd have the time to prepare and then share a piece on "carbon." But right now things are busy in the "Curmudgeon's" world. I do have lots to write about... but no time today. Because I'm in a time "crunch." And I have a lot to push off my desk this morning before I rush off to "court." Because I have to get the "cash" flow going in 2008. So I'll have to "catch" up later. Here's a story posted on Yahoo! 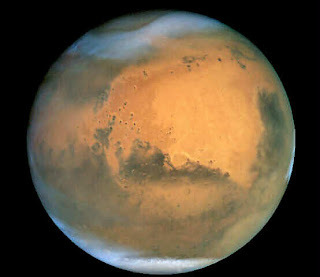 News the other day about how Russia believes it has pulled ahead in the race to Mars. Americans don't think we're in a race for Mars. Instead we're obsessed with whether Dr. Phil should or should not do a show about Britney Spears... or whether the Patriots will or will not succeed in their quest for an undefeated season... or whether Roger Clemens did or did not use steroids.... We are navel gazers now, not star gazers. Unless the 'star' is Tom Hanks. For Americans, a 'binary star' is Brangelina... or Tomkat. I know I've used this line before, but I wonder if there was a similar mood in Portugal in the decades after Prince Henry the Navigator -- and I don't refer to an obsession with 'celebrity' or trivia, but rather to a belief that we must look inward, and solve our own problems at home, before resuming our outward drive. Portugal never resumed. America is a frontier nation: Expansion is hard-wired into our character. Would you rather see our restless, questing youth carving out new cities on the Moon or Mars... or dodging bullets and bombs in Iraq and Afghanistan? There are those in America who are prisoners of the expansionist urge, but do not have the vision of outer space. I believe they're called "neocons." And what if Earth really is on the cusp of a dramatic climate shift? Even if Al Gore's all wrong about human contributions to global warming, the Earth has experienced dramatic climate changes in its history. And there have been cataclysmic extinction events in Earth's past as well. We're just learning about 'supervolcanos' -- catastrophic eruptions, like those of the Yellowstone caldera, volcanos so huge that we puny, short-lived, newcomer humans didn't even recognize them for what they were. And then there are meteorites, like the one which finished off the dinosaurs 65 million years ago. (The latest research suggests that dinosaurs were already in decline -- being unable to cope with climate change.) The survival of our species may depend on scattering our genes across the Solar System... and eventually the Galaxy. Unfortunately, we can't just expect private industry to take over and put us into space to stay: Rockets must fly through airspace -- government regulated -- and over cities and rivers and towns and lakes and streams. There are pollution regulations to consider, and safety regulations, too. (What goes up might come down on an undesigned trajectory....) No, any private Enterprise (oh, there's a pun) would still be subject to serious government oversight. For the present, therefore, we must rely on the national government to take us to these new heights. But governments -- I think all governments, not just ours -- are poor innovators. Meanwhile, in other news, India's Tata Motors has unveiled its new ultra-cheap Tata Nano. It turned out not to be the miracle compressed air car from Tata that I wrote about last May... but it may be India's Model T.
One senses that India may be a country on the rise... that the baton of innovation may have passed from America to South Asia. I submit, in fact, that these stories are related. India seems to have a national vision, a goal, a dream to modernize and take its place among the great nations of the world. America plods on, without vision, without consensus, without a great goal behind which we can unify and move outward. I just finished reading Stephen Baxter's 12-year old novel, "Voyage" -- about a trip to Mars that never happened. Baxter's a pessimist among pessimists: I think we can do much more and much better than he was willing to envision. But even he recognized that a Mars trip was important, worthwhile and achievable. I write that America is lost in space fully aware of the Space Shuttle and the ISS -- the Space Truck and the Space Truck Stop. We have a Chicago-area astronaut on board ISS right now -- Dan Tani -- marooned, temporarily, because of the latest delays in the launch of Shuttle Atlantis. Tani briefly percolated into American consciousness because his mother was killed last month in a railroad crossing accident... and, of course, Tani couldn't get home for the funeral. The Shuttle is about to be retired; it should have been retired long ago. But there's no replacement ready to go. There's no apparent broad-based support in this country for continued exploration -- and exploitation -- of outer space. Am I the only one who sees this as a tragedy? And another reason why lawyers shouldn't do math. Or maybe it's just me: Every day I start out with high hopes. I will accomplish 2 tasks in x hours. At the end of the day, however, I'm lucky if I've accomplished 1 of those tasks in 2 * x hours. I really need to work on my time management skills. And my expectations. Older Daughter was at our house a couple of days this week, coming back from New Year's revels with the Boyfriend's friends before heading back down to Champaign for work and school. Older Daughter was surprised that I was home early from work the other night, but I explained that I had a doctor's appointment. Long Suffering Spouse asked if I wanted a bite of dinner before we left. Now Older Daughter was horrified. "You mean you're going to eat before going to the doctor?" "Why not?" I asked, going to the kitchen to fill my plate. "Aren't they going to weigh you?" Long Suffering Spouse could stand by no longer: "It's worse than you know," she told Older Daughter. "He doesn't even take off his shoes!" "No!" gasped Older Daughter and she and Long Suffering Spouse proceeded to compare notes about the various articles of clothing they routinely discarded before venturing onto the doctor's scale. It's a wonder they don't catch cold every time they go. Buoyed by surging poll numbers, Illinois Senator Barack Obama went into yesterday's New Hampshire primary thinking he had donned the mantle of the new frontrunner for the Democratic presidential nomination. He should have known better. Oh, he did get a wardrobe change alright -- but what he got fitted with was the jacket of extreme expectations. There was a record turnout on the Democratic side in New Hampshire yesterday -- 280,000 people took Democratic ballots. That's a lot of people... but more people than that voted in the 2006 judicial primaries in Cook County... and a heck of a lot of primary voters in Cook County skip the judicial ballot altogether. So the record-setting primary turnout from an entire state is less than half of those who voted in Cook County in an off year election. Could I get some perspective with these New Hampshire results, please? Here's my prespective: These early primaries aren't about winning the vote totals -- they're more like stock predictions. When XYZ Corp. posts its quarterly earnings, no one is happy unless those earnings 'beat the Street.' Even if XYZ posts a record profit -- if the profit was smaller than Wall Street's prediction, XYZ's earnings would be deemed a disappointment. Now the analogy: It was only recently, we are told, that Obama was trailing by double digits in the New Hampshire polls. If he finished second in the voting and those were the last polls available, pundits would be proclaiming Hillary finished... and she might have been. But the polls changed. Dramatically. Now I do not suggest for a moment that the Clintons found a way to manipulate the New Hampshire polling data. Nor would I object, seriously, even if an email blast could be traced back to Clinton headquarters advising all of Hillary's loyal followers to declare allegiance to Obama if asked by a pollster. I'm from Chicago, where Mike Royko once told us we had a civic duty to lie to pollsters. I do firmly believe, however, that in a past life, Bill and Hillary Clinton taught Nicolo Machiavelli all he knew about politics. 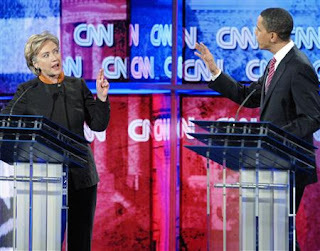 Obama's alleged surge in the polls could only inure to the benefit of Sen. Clinton. Even if he had won yesterday, but by single digits, Hillary's people could rightly claim that she bested expectations -- and that Obama disappointed. On the Republican side, I have a question. I keep hearing about Ron Paul and how he's an Internet phenomenon. I keep hearing that, despite the herculean efforts and dark conspiracies of the mainstream media to keep his message from the people, Dr. Paul is catching fire with the electorate. So my question is: Shouldn't that begin to translate into votes at some point? On this first business Tuesday of the New Year, Barb, the Lead Guru of the Heads or Tails Cult, the mysterious Eastern philosophy that is attracting new adherents every single day, asks us to meditate about (Heads) "Old" or (Tails) "New." Here in America, we're mired in a seemingly endless process of replacing our old President with a new one. In fact, not only has voting begun today in New Hampshire, voting is already concluded in tiny Dixville Notch where Barack Obama pulled away from the Democratic field with seven of the 10 votes cast. There was 100% turnout in Dixville Notch this morning -- all 17 registered voters showed up. Seven took Republican ballots. And Hillary received no votes at all in Dixville Notch. And somewhere, right now, on a cable news channel, some over hairsprayed pundit is prognosticating -- extrapolating from this quadrennial publicity stunt. It is an old, and very lame, tradition. The good news is that we are at long last counting somebody's votes -- even if they are mostly from some of Boston's suburbs. The bad news is that it's several months too early: Why are we doing this now when the general election isn't until the first Tuesday in November? And the worse news is that, when they're done in New Hampshire, the candidates will disperse to multiple states, among them Illinois -- which moved up its primary this year to February 5. Yes, we have a new primary date. Our primary used to coincide with the feast of St. Patrick... so all the candidates played up the most tenuous Irish connections imaginable. Now, what will happen? Will they all be groundhogs? Oh, if only the politicians would hibernate another six weeks. But, alas, there are 800 numbers calling my home phone at all hours of the day and night already. And they're not all creditors. A story posted today on Yahoo! News by Dave Mosher of LiveScience.com discusses an Israeli study that says daytime naps may boost long-term memories. And none of those wimpy catnaps, either: No, a good solid 90-minute nap seems to be the best for locking in long-term memories, which are defined as "memories that stay with us for years, such as 'what' memories — a car accident that happened yesterday — or 'how to' memories, such as one's learned ability to play the drums or tear it up in a game of soccer." In fact, I'm thinking that the itinerary for an ideal day might be to first visit the laziness exhibit at the Museum of Bogota, Colombia... and then consolidate my long-term memories of the trip with a nice nap. The Positive Coaching Alliance has released its annual list of the Bottom and Top 10 Moments in Sports for 2007. (That's supposed to be a 'permanent link' to the PCA website; here's a link to a post I did in December 2006 about the 2006 Bottom 10). This year, the PCA has come up with a pretty sweet gimmick: The Mitchell Report on steroid usage in baseball is at the top of both lists. The PCA lists it as no. 1 in the Top 10 because it provides "a chance for parents and coaches to capitalize on teachable moments with youth athletes and steer them away from cheating and drug use." Teachable moments, eh? I kind of like the phrase. I would go out on a limb here and suggest that rushing onto the playing field in any sport before play is halted is probably a bad idea. Just in case someone reading this thinks this applies just to wrestling and not to youth soccer. Or baseball. This worried-looking fellow on the right is Mitch Cozad. He was, at one time, the backup punter on the University of Northern Colorado football team. He apparently decided that the way to move up on the depth chart was by maiming the starter. This link will take you to the story about his conviction and sentence for the crime. That's No. 3 on the PCA's Bottom 10 List. Teachable moment here? Don't try and assassinate the kid who plays in front you. That's pretty clear and unambiguous. Less clear and more ambiguous is this story from Lincoln, Nebraska about a soccer mom who threw her daughter out of the car along Interstate 80, allegedly because of her daughter's poor performance at a just-concluded soccer match. That story rates No. 4 on the PCA's list. And I suppose one possible teachable moment here is that soccer is bad for you. But... c'mon... reading the story, one finds out that the girl in question was 15. What parent of a 15-year old hasn't been tempted to put that teenager out on the side of the road at some point? Even if they never played soccer? To cleanse yourself of the foregoing mean-spirited and cynical rendition, feel free to read the Top 10 list as well. In some families any girl who makes it to a second date is provisionally adopted by the boy's family (or vice versa). I don't subscribe to that myself. Call me a curmudgeon, but I don't really want to invest the time and effort in getting to know someone and forming opinions (positive or otherwise) about the young man or young woman, only to watch that kid get dumped by my kid the next week. My position is simple: I'll be nice to anyone my kids bring home, but I'm not forming any attachments. I'm nice to Older Daughter's Boyfriend (ODB). Older Daughter has been dating the same young man now for several years -- but there is as yet no ring. I did confirm with Older Daughter, in the course of the recent holidays, that she and ODB have had full and frank discussions on a wide range of topics and that the matrimonial option is under consideration. But nothing has yet been decided -- so I'm trying not to get too used to ODB. Even if he stays at our house every few months. Recently, you may recall, Oldest Son revealed that he's seriously dating someone. He flew to Texas to meet her folks before Christmas; he suggested that he might bring her to meet us after Christmas when she came to Chicago. Sure, I said... and then I got on the phone. Long Suffering Spouse was none too pleased that I arranged a party -- she knew on whom the burden of preparation would fall -- but it seemed to me it would be a lot of fun for everyone in the family to take a gander at Oldest Son's new prospect. For everyone, that is, except Oldest Son and his girlfriend. Yes, I knew what it was like... and I did it to Oldest Son anyway. Still, it was a grand occasion. Long Suffering Spouse did manage to get some minimal cooperation from a couple of the other kids (mostly by pointing out that she was still recovering from surgery) and I got hold of my friend Steve and my sister Betty. Betty is Oldest Son's godmother. Years ago she found she could embarrass him nearly to death by ruffling his hair and making baby talk noises and trying to kiss him. It's even funnier now that he's 22. Oldest Son and his girlfriend were seated on the living room couch making awkward small talk with the rest of us when the doorbell rang. And Betty proceeded to muss his hair and coo at him and plant a big, exaggerated smooch on his cheek. He squirmed ineffectually and the girlfriend watched. But you know what? It all seemed to go well -- the girl seems very nice -- and -- Younger Daughter assures me -- Oldest Son's Facebook status remains unchanged. Was I cruel? I don't think so -- not really. After all, Oldest Son did volunteer to bring her over. And it was a lot of fun. Is everybody home yet from New Year's Eve? Middle Son is still Downstate as I write this: He and a group of friends (mostly from his high school days) went to Champaign for New Year's Eve. There was some discussion about whether they'd start back for Chicago before or after the Rose Bowl. And when Middle Son called late yesterday afternoon to inquire whether we would have strong objection to this staying an extra night, Long Suffering Spouse and I readily agreed: Better to come home in the morning, clear-eyed and clear-headed. But my New Year's Eve anxiety meter is still ticking. And it's already January 2. Long Suffering Spouse and the kids who are still at home are lamenting these last couple of days of their Christmas break are already here. But as for me... well, I'm kind of happy that the break is ending. No, I'm not still imitating Ebeneezer Scrooge or the Grinch... it's just... well, when everyone in the house has to get up in the morning, it's much easier for me to get up in the morning, too. There's a certain comfort in an established routine, isn't there?